Today we decided to create an ode to one of the most exciting art, fashion and interior style movement of the last century: Art Deco! Art Deco was a popular fashion and aesthetic movement in the 20 century revolving around geometric patterns, clean lines and metallic color scheme. Art Deco bathroom is also based on these requirements and most likely has a sleek, profound and bold aesthetic appearance. If you are a fan of this distinctive and sophisticated taste of style then you are going to like what we’ve prepared for you. We’ve rounded up a showcase of 25 Amazing Design Ideas that could serve as an inspiration. Check out the round up below and enjoy! The advanced architecture of the attic in combination with the clean lines and pops of silver bathtub bring the Art Deco theme in this beautiful, bright bathroom. The glass walk in shower contributes to the modern feel in this bathroom. Look at the splendid and charming feel of this bathroom. It’s overwhelmingly beautiful, right? – The marble built in bathtub and golden faucets bring luxurious charm to the clean lined bathroom with a bright and pleasant feel. 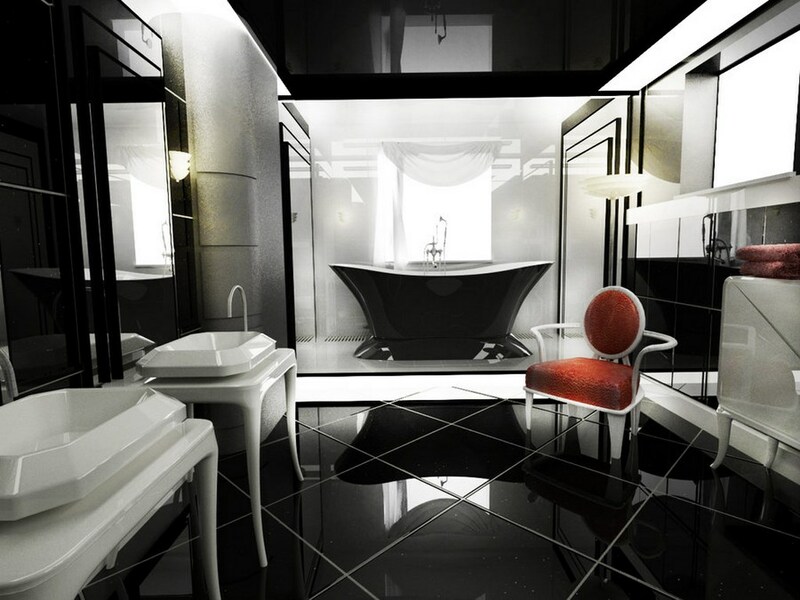 black and white bathroom design. So bold and striking, right? The wide black bathroom tiles with an exceptionally glossy surface contrast the bright white vanity that creates the dramatic contrast in the Art Deco Interior. The pop of red brings a sensual and charming vibe in the fierce dark bathroom. We love the geometric appearance of this beautiful and charming Art Deco bathroom with a sophisticated and distinctive taste of style. The noisy wooden vanity brings a naturally, cozy charm and the white and black striped rug brings a vibrant and contemporary vibe in the bathroom interior. Bright And Clean Bathroom Inspiration. The built in bathtub in a beautiful white crafted wood paneling creates a superb and comfortable ambiance in the bright and pleasant Art Deco bathroom. The contemporary accent chair just strikes the bathroom with a sophisticated and classy charm. 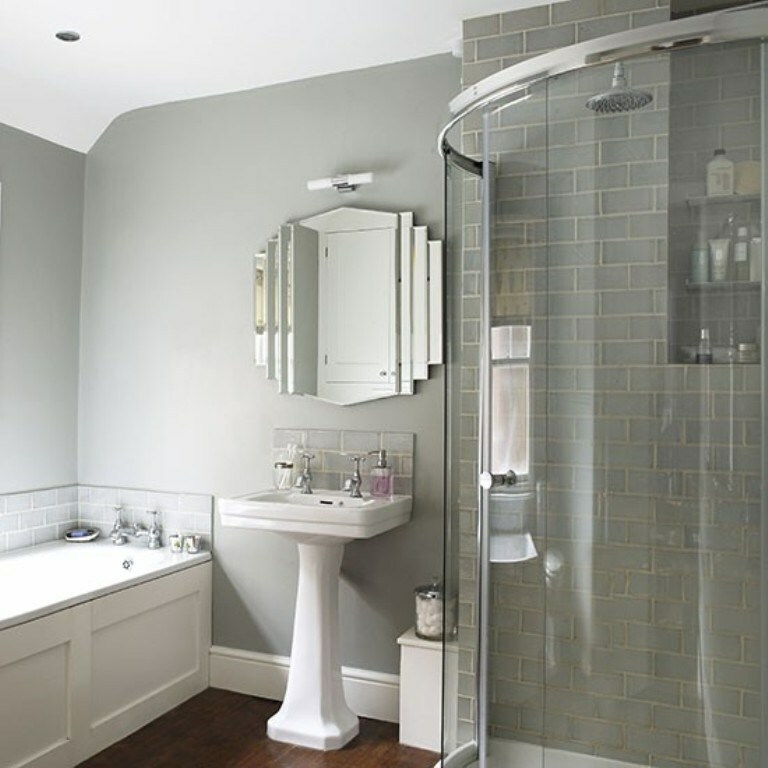 This spacious bathroom is exceptionally beautiful! 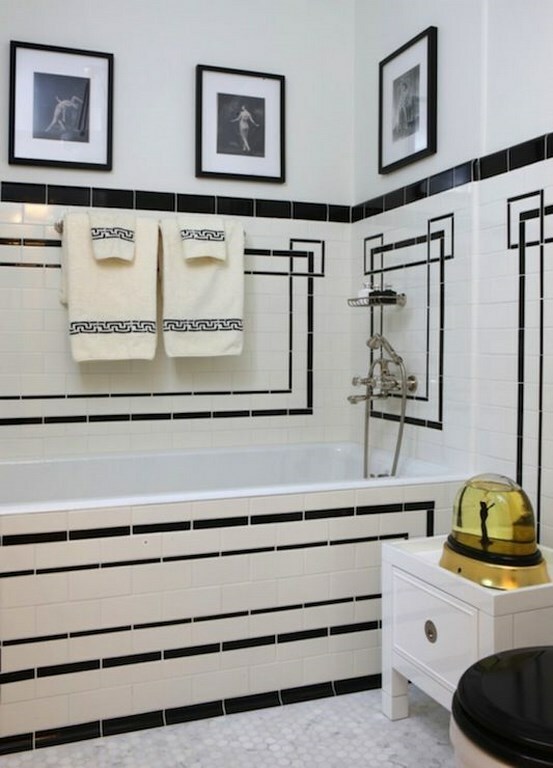 The multitude of geometric patterns and clean lined white vanity is striking with the Art Deco charm in this beautiful high contrast bathroom. 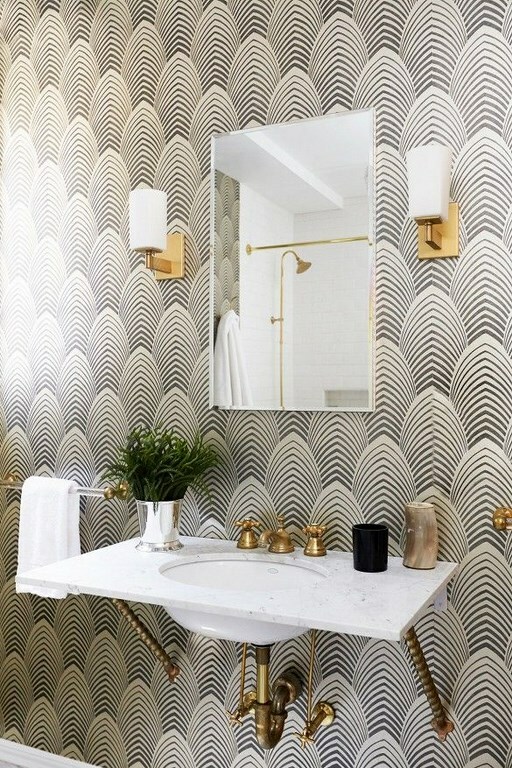 The patterned wallpaper in combination with the vintage white and brass bathroom sink creates a distinctive and beautiful appearance in this classy Art Deco bathroom. The geometric mirror strikes as a modern focal point and decorates the wall. 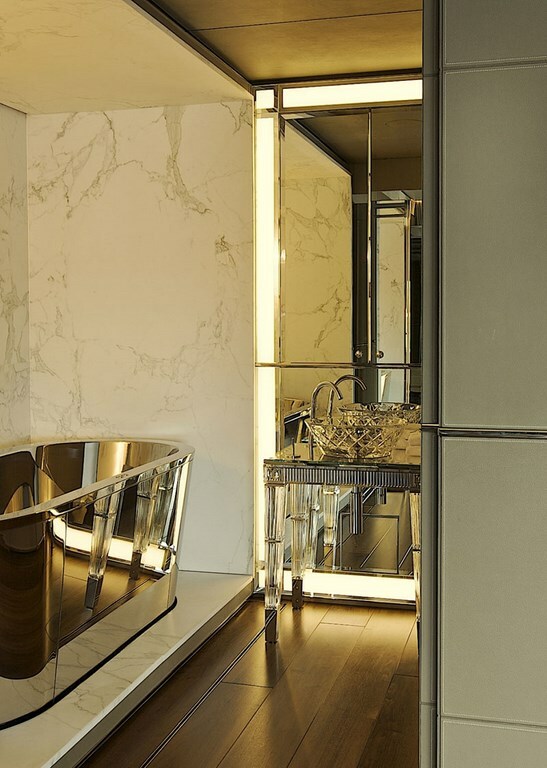 This is a typical Art Deco bathroom that reflect utterly distinctive and refined ambiance with a bold and dramatic appearance. The white and black subway bathroom tiles create the high contrast and boost up the geometric and classy appearance of this bathroom. 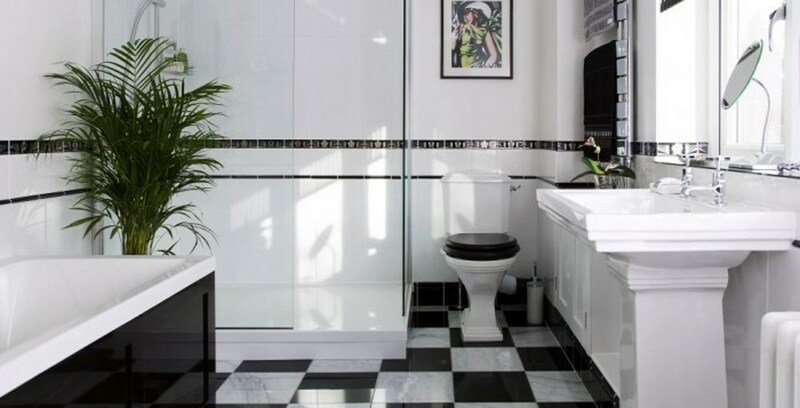 The white and black floor tiles in a vintage fashion bring a bold high contrast effect in the white Art Deco bathroom, decorated with modern art, lush plants and superbly contemporary glass walk in shower. 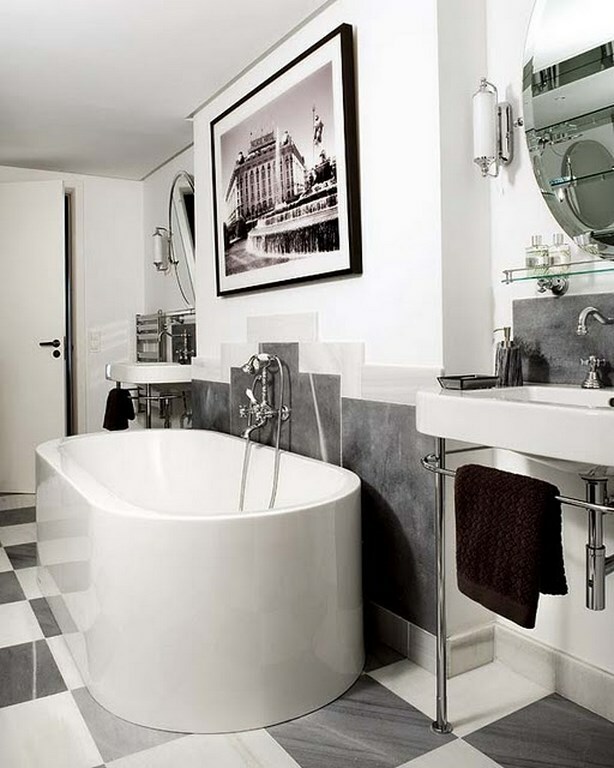 Here is another classic Art Deco bathroom with gray and white color scheme and really refined modern appearance. The classy artwork above the contemporary stand alone bathtub brings the “Art” in this amazing Inspiration. 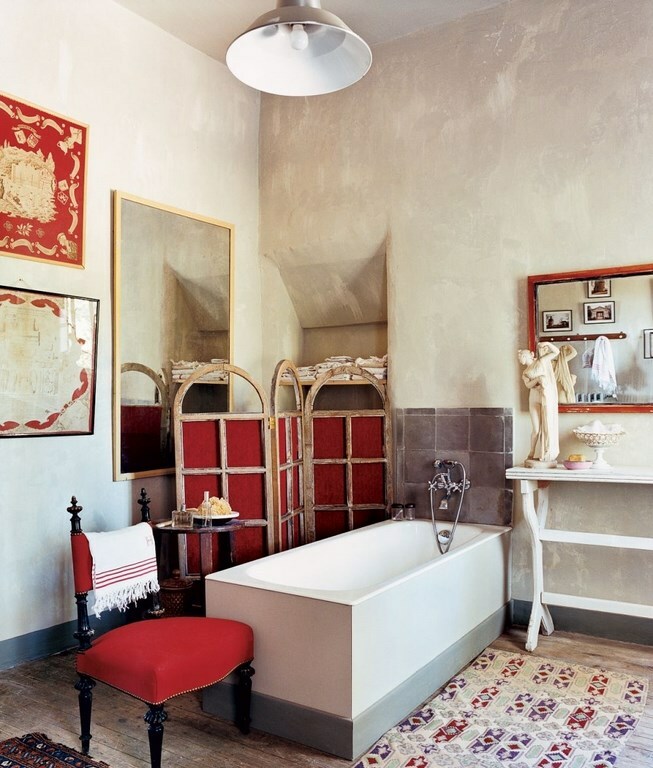 Blend of concrete wall, baroque red chair and contemporary stand alone bathtub create the foundations of this marvelous Art Deco bathroom. The rich and opulent decorative palette bring a distinctive and sophisticated ambiance in this high end bathroom interior. The white claw foot tub brings a soothing feel in the noisy and opulent Art Deco bathroom. The vintage beige wallpaper with floral print sets an opulent and rich visual effect in the cozy and charming Art Deco Bathroom. The combination of gray and white color scheme works perfectly for creating a balanced and tranquil ambiance in an Art Deco Bathroom. The decorative mirror works perfectly as a focal point and creates a nice artistic touch in the interior. Minimalist setting with an Art Deco touch is a perfect choice for people who both love the open space of minimalist bathroom but want to keep the opulent and distinctive charm of an interior. 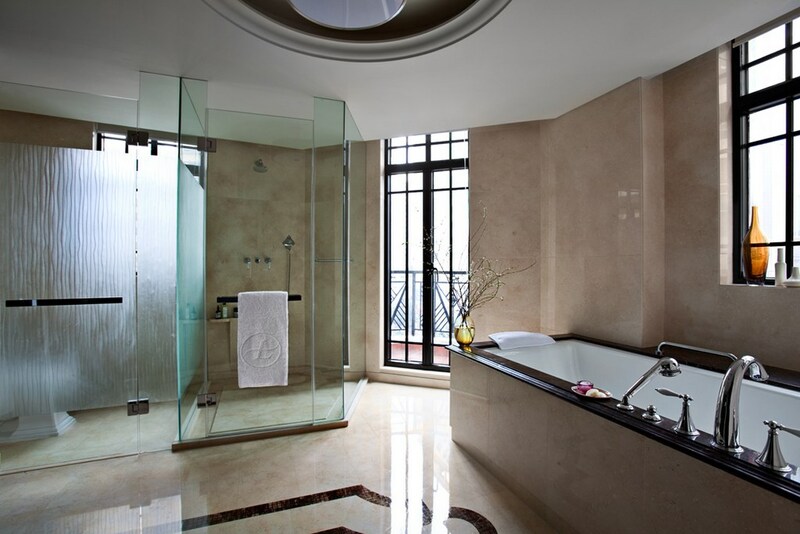 The sleek and refreshing ambiance of this bathroom is simply beautiful. The marble floor with minimalist black motifs, the glass walk in shower and the accent wooden vanity with marble top create the clean, natural and opulent appearance of this Art Deco bathroom. 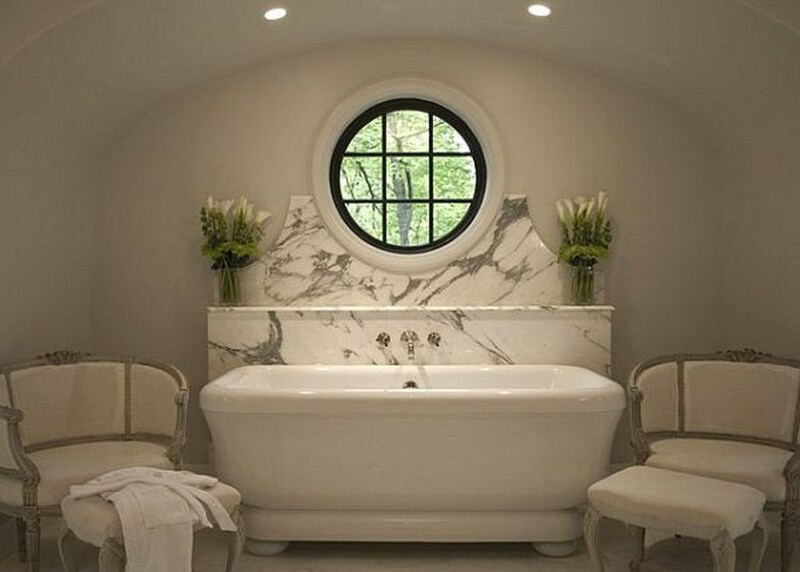 The round mirror with black frame and the two antique accent sofa with ottoman say it all about this beautiful and serene Art Deco bathroom. 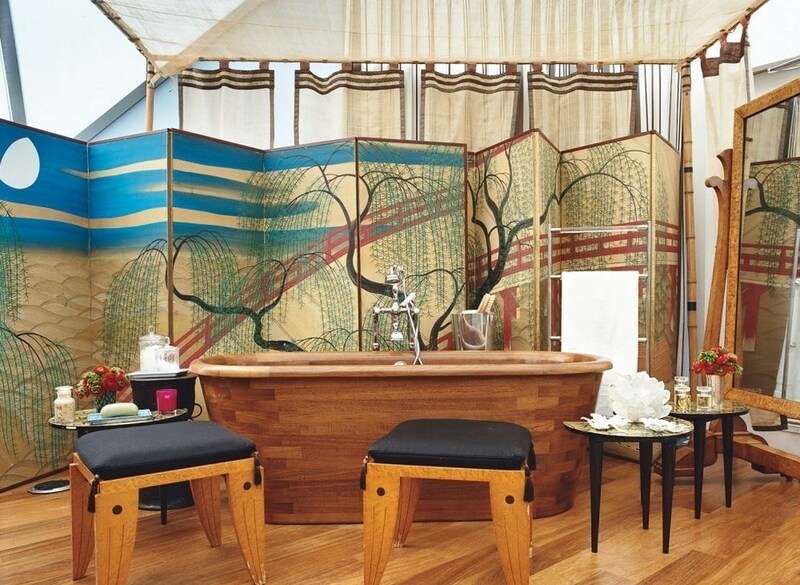 This spacious Art Deco bathroom is simply amazing and captivating. The beige marble wall in combination with glass walk in shower creates an elegant and pleasant ambiance in the superbly designed interior. 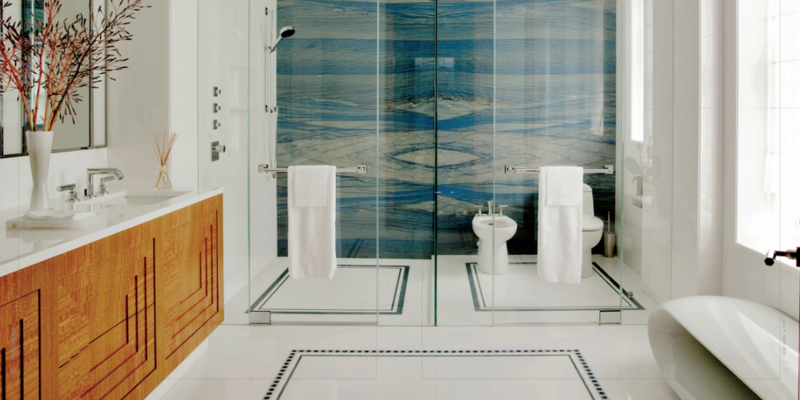 The gallery concept of this bathroom goes perfectly with the dark gray marble and classy decorative palette. 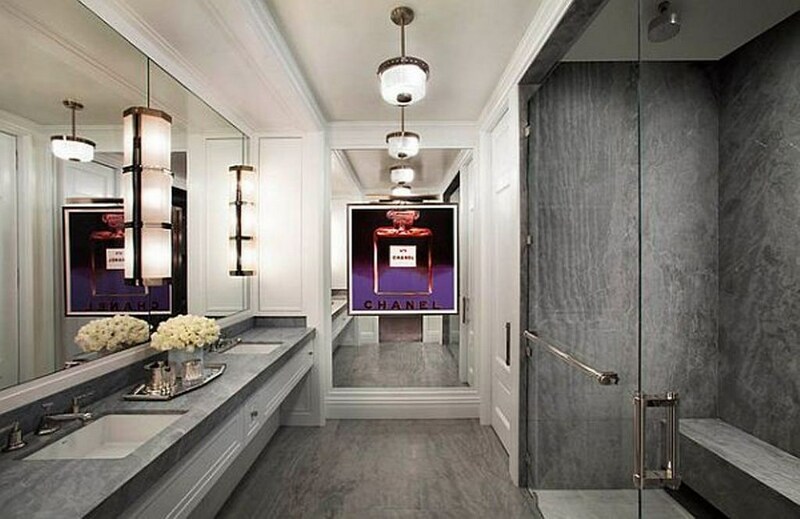 The luxurious light fixtures in combination with the pop art Coco Chanel poster brings drama and an artistic feel to this magnificent bathroom. Marble wall and painted gold bathtub! 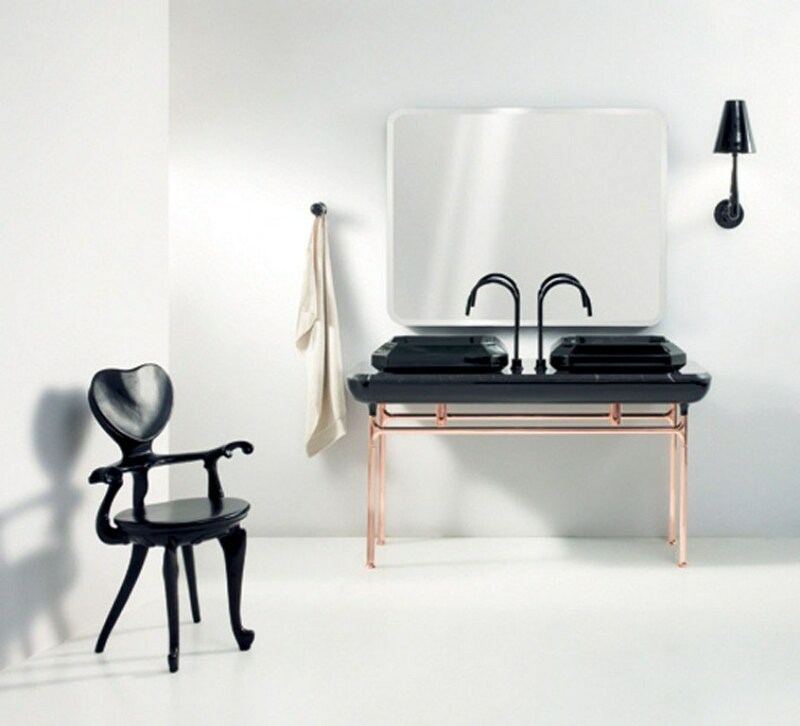 Those are “the” elements for creating a sleek Art Deco bathroom. The wooden floor brings natural charm in the overall dashingly splendid bathroom with accent brass bathroom sink, vintage glass bathroom vanity and mirrored wall. This bathroom is dashingly beautiful and captivating. 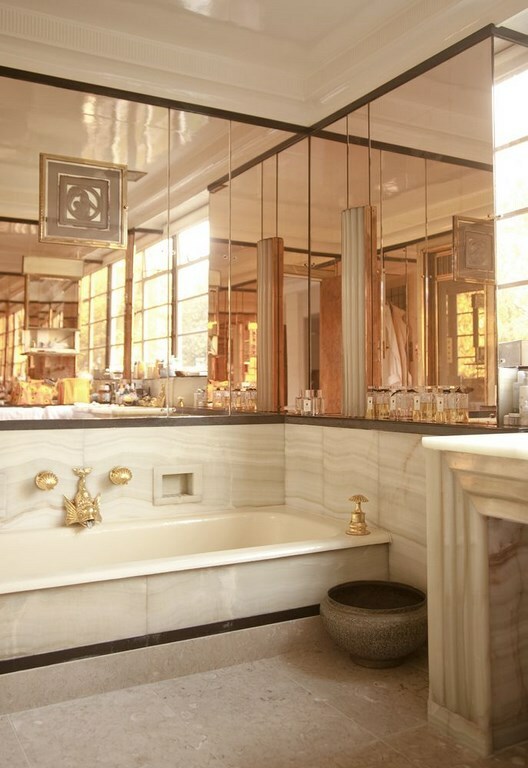 The wooden bathtub acts as a main charmer in the distinctive and beautiful Art Deco interior. The wooden chairs with black silky cushions bring an exotic and sensual charm in the classy interior. Look at this bathroom! It’s utterly amazing and awe inspiring, right? The black white plaid accent wall brings a specific glamour and splendid vibe in the overall sleek and chic bathroom decorated with a glass walk in shower, white and black contemporary vanity and sleek black vinyl floor.